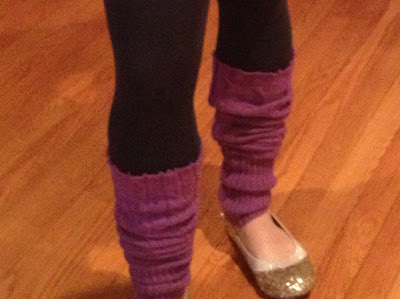 I may be a child of the 80's, but that doesn't mean I keep leg warmers around these days. 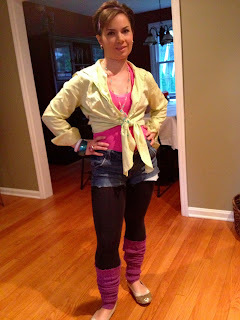 So when we were recently invited to an 80's party for a friend I knew I needed to make leg warmers to complete my 80's outfit. I was short on time, so I looked around my closet (thankfully all I found was the leggings and the pink tank top) and the thrift store and pulled together this 80's outfit complete with DIY leg warmers. PS: All I have to say is thank GOD it's not the 80's any more! in half so the arms would lay on top of each other. Then I just cut the arms off...wa la instant leg warmers. Now if you need them for more than just a 4 hours 80's party you may want to fix up the raw edge a little bit, but this way worked perfectly for my needs. While I don't regularly rock leg warmers, they're actually highly functional for babies who are still in diapers -- especially when it's chilly out and going without pants isn't an option. They allow diapers to be changed without taking off the entire outfit. 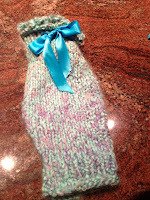 So I thought I'd make a pair newborn legwarmers from this adorable hand knit sweater. I actually used the same technique to make a pair of baby leg warmers as I did the adult version. After I cut off the sleeve, I folded the raw edge down and sewed it so it wouldn't fray. To make sure they stay up on little baby legs, I used a needle to draw a ribbon through the top of the leg warmers, under where I had stitched. The ribbon can be adjusted to keep them up on little baby legs. How cute are these baby leg warmers? I'll soon have them for sale on my soon-to-be opened Etsy shop so check back!